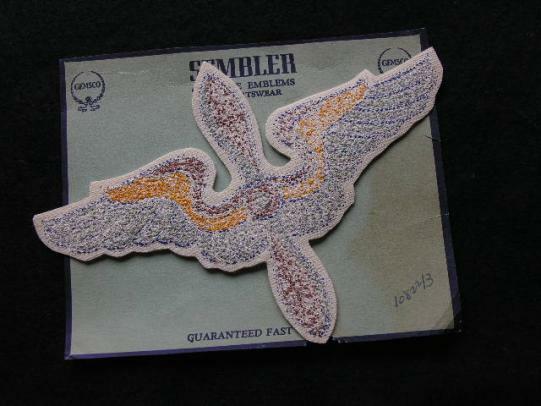 Here is a mint "Stubby" wing 8th Air Force English made patch embroidered in silk thread on felt with a paste back. Quality piece. A scarce theatre made 14th Air Force "Flying Tigers" hand made patch. quality embroidery and detailed workmanship. Used and removed from uniform in good condition, some light service wear and light fading. This is an English made original Airborne Troop Carrier patch. Silk embroidered on wool in near mint condition. IX Troop Carrier Command consisted of three troop carrier wings, 14 troop carrier groups, and one pathfinder group, totalling approximately 1380 operational aircraft including spares, and 2,000 gliders at its maximum strength in March 1945. A good original 9th Air Force English made patch. Silk embroidered on wool in mint condition. An Aviation Branch insignia in Red and orange, made in Chenille pattern embroidery on felt for sportswear. Made by Gemsco and comes in original packing in mint condition. An English made embroidered Mighty 8th Air Force patch. Used and removed from uniform. Good period piece in near mint condition. An English made embroidered Mighty 8th Air Force patch. Used and removed from uniform, top edge has a small tear (could be trimmed). Good period piece. 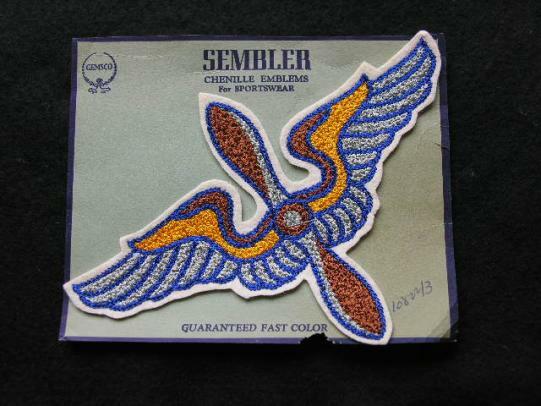 An Aviation Branch insignia in Blue, made in Chenille pattern embroidery on felt for sportswear. Made by Gemsco and comes in original packing in mint condition. An Air Force GHQ patch, used and removed from uniform in good condition. Here we have a set of 16 original period patches for the U.S. Army Air Forces.